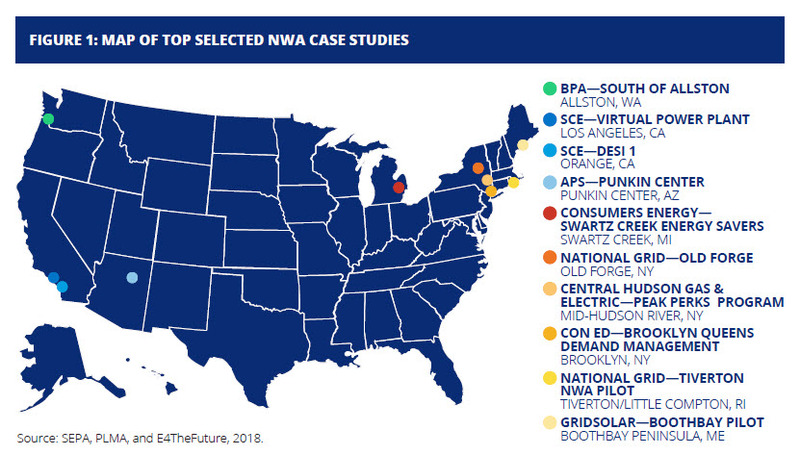 November, 2018 — Report by E4TheFuture, Smart Electric Power Alliance (SEPA) and Peak Load Management Alliance (PLMA). Non-Wires Alternatives: Case Studies from Leading U.S. Projects provides fresh insight on how Non-Wires Alternatives can use distributed energy resources—including energy efficiency, demand response, solar, storage and microgrids—as least-cost energy solutions. The report profiles 10 industry-leading NWA projects of different sizes and types across the U.S.
“If you look for solutions beyond stringing power lines, you can find plenty of real-world examples of less expensive alternatives that meet consumers’ energy needs, enable clean energy, allow utilities more flexibility, and shrink energy infrastructure’s environmental footprint,” said Steve Cowell, president of E4TheFuture. ● Existing NWAs have successfully delayed or deferred infrastructure investments, providing significant cost savings. ● Load growth forecasts don’t always get it right. ● Open and technology-agnostic approaches fostered project success. ● NWAs encourage new utility business models. Non-Wires Alternatives: Case Studies From Leading U.S. Projects is available for free download. Steve Cowell of E4TheFuture, Sarah Arison of Bonneville Power Administration, Mark Sclafani of Central Hudson Gas & Electric, Tiger Adolf of PLMA, and Brenda Chew of SEPA will discuss insights from the report on Nov. 13 at the PLMA Conference in Austin. SEPA, E4TheFuture and PLMA will co-host a free webinar at 2 p.m. EST on Dec. 6, 2018; register here.